The story of Superman is so well known that I hardly need go into detail. But in case you’re some sort of commie, the idea is that he was born on the planet Krypton orbiting a far away red star, and sent to Earth while still a baby by his parents as their home planet exploded around them. Our yellow Sun somehow gives Kal-El superpowers, and he goes on to star in a series of increasingly poorly-made movies*. I’ve often wondered exactly what kind of star Krypton orbited and where it was. Up until now all we’ve known is that it was red, and red stars come in many flavors, from dinky red dwarfs with a tenth the mass of the Sun up to massive supergiants like Betelgeuse which outweigh the Sun by dozens of times (I’ll note that a deleted scene in "Superman Returns" indicates it’s a red supergiant). Well, that’s about to change. 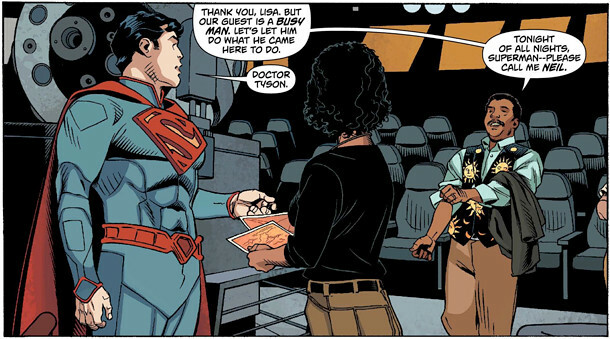 DC comics is releasing a new book this week – Action Comics Superman #14 – that finally reveals the answer to this stellar question. And they picked a special guest to reveal it: my old friend Neil Tyson. 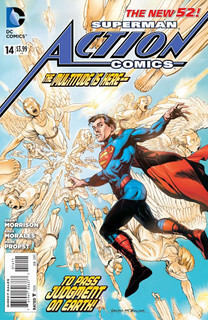 Actually, Neil did more than just appear in the comic: he was approached by DC to find a good star to fit the story. Red supergiants don’t work; they explode as supernovae when they are too young to have an advanced civilization rise on any orbiting planets. Red giants aren’t a great fit either; they can be old, but none is at the right distance to match the storyline. It would have to be a red dwarf: there are lots of them, they can be very old, and some are close enough to fit the plot. I won’t keep you in suspense: the star is LHS 2520, a red dwarf in the southern constellation of Corvus (at the center of the picture here). It’s an M3.5 dwarf, meaning it has about a quarter of the Sun’s mass, a third its diameter, roughly half the Sun’s temperature, and a luminosity of a mere 1% of our Sun’s. It’s only 27 light years away – very close on the scale of the galaxy – but such a dim bulb you need a telescope to see it at all (for any astronomers out there, the coordinates are RA: 12h 10m 5.77s, Dec: -15° 4m 17.9 s). Which brings us back to the Superman story. I was sent an advance copy, and it’s actually a clever tale, with some relatively solid science in it. I won’t spoil it, but apparently Superman comes to visit the Hayden Planetarium in New York City (where Neil is the director) every 382 days, which happens to be the period of Krypton around the star (known as Rao in the comic canon). Although it’s not said explicitly in the story, it sounds like they try to observe Krypton when it’s at the point in its orbit where it appears farthest from its star, reducing the glare and making it easier to spot†. As for the major plot point of the story, I won’t reveal it. But I’ll give you a hint: Superman is about 27 years old. PLEASE don’t leave any guesses in the comments below until a few days after the issue is out. I want to avoid spoiling it for any other readers. Being a dork, I have to comment on some of the science in the story, though. Given the mass of a star and the period of a planet orbiting it, you can find the distance between the two. Doing the math (I’m a dork, remember?) I find the distance of Krypton to its Sun is about 100 million kilometers, somewhat closer than Earth is to the Sun (150 million kilometers). But remember, Rao is a dim red dwarf! It’s so cool and faint that even at that closer orbital distance, Krypton would be a chilly world. Even if the planet is black as soot (and thereby absorbing all the heat falling on it from Rao) its temperature is still something like -170° Celsius – about -270° F! [If you’re curious, I outline how to calculate this on the Bad Astronomy website.] At that temperature oxygen and nitrogen are still gases – barely – but it’s way below the freezing point of water. And if it’s not black, but instead snowy and white, the temperature will be even lower. So Krypton maybe isn’t the best place for life to arise… still, there are ways out of this. Maybe either the Kryptonians migrated there (they couldn’t find a warmer planet?) or there’s something else going on. If it’s really volcanic then greenhouse gases could be prevalent, raising the temperature. Possibly the planet’s interior is still warm from heat leftover from its formation… or maybe whatever made it warm enough to be habitable also led to its destruction. Comic book science can be pretty ironic. I also feel obligated to note that in the comic, they made the planet look much larger than the star. That doesn’t work; the two are so far away it doesn’t matter if Krypton was on Rao’s near or far side; it would have to appear smaller than the star. We know Krypton is not a gas giant, so it can’t be much more than a few times Earth’s size. Even compared to a red dwarf that’s pretty small. Still, it does make for a dramatic series of panels, and I’m always willing to let art trump science if need be. And this really is a pretty nifty story. The issue comes out on November 7, and I’ll be heading over to my local comic store (Time Warp) to pick up a copy. Next time I see Neil maybe I’ll get him to sign it. It’s not too often I get to do that with someone who knows Superman. * I love – LOVE – the 1978 Superman movie, and I still to this day listen to the soundtrack, so you can argue with me over this, but you will be wrong. † This actually happens twice per orbit, when it’s on either side of its star. That means the orbital period is actually twice 382 days, or well over two years… and as you’ll see, that puts it farther from its star, making things worse. – Apparently, Black Widow knows me. And maybe Nick Fury, does, too.